www.newzimbabwevision.com says, let those who are willing to die for lack of foresight, go ahead and challenge the military, but let Chamisa, walk the talk, lead the way and take the first bullet,..for the people for the mother country and the whole nation will stand up in defiance as they bury the fallen like heroes,..wake up Zimbabwe, there are better ways of achieving freedom than blindly walking into your own deaths ! On Sartuday 16 March 2019 the MDC leader Nelson Chamisa has said his party will soon be exerting more pressure on President Emmerson Mnangagwa and his government until they come to the negotiating table to resolve the countryﾒs intertwined political and economic challenges. Addressing a provincial council meeting at Mucheke Hall last Saturday 16 March 2019, Chamisa said the situation in the country had become unattainable and the people were being robbed by their government on daily basis. “The stay away protests organised by the ZCTU are nothing compared to what we are planning. They said we planned the stay away but we do not stay away, we stay in. We did not want to say anything on the ZCTU stay away because we knew it could have been worse,” said Chamisa. “If things remain unchanged, we are going to call everyone to Harare. This will not be a one day protest but we will camp in the streets for the whole week until things change. “We will not get into the streets and go out without achieving our goal. Be prepared for action, Masvingo get ready. We want to see everyone from Masvingo in Harare when we give the green light. We are not going back because we know who the people voted for. If we do not defend the people’s vote, we risk having a situation where no one will vote for us in future elections because they will say we vote for you and you do not defend our vote,” said Chamisa. “We want to take over now. 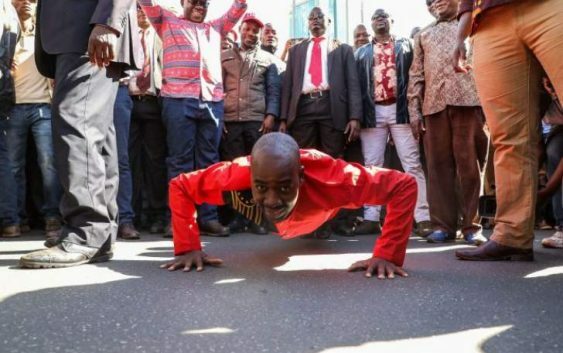 We will not wait for 2023 because by then we should be doing our second term,” said Chamisa. “I told Zanu-PF people that we do not want violence. I told them that shops that sell guns have not closed. Guns have not stopped to be sold in the country but we will not go for guns not because we canﾒt use them but because we do not want them. “They should not underestimate us and walk all over us. When we say letﾒs shake hands and you come with clenched fists or catapults, we will show you that we have other things we can do, dry hands not catapults. Can you imagine if we say everyone across the country come to Harare, Mnangagwa will not have a chance,” said Chamisa. A commentator -TinosPray Donsah says All what chamisa is doing is to cause instability in the nation. All what he is forcing to get is attention from the masses as he know that when he acquire attention, it’s going to be difficult for the government to offer welfare to the people. I think people should not listen to this power hungry young man. It can also be a worst story with him into power because his intentions are not to see Zimbabweans having better lives but only to see himself into power. Wise people should not risk themselves and go into the streets where fools will be dying for Chamisa under the guise of mulfunctioning government. Chamisa cannot be claimed to be a man of God as he is disuniting people of the same land. Even Mnangagwa and his government are wrong, the way Chamisa is addressing to that is satanic. He should know that people of Zimbabwe are not in need of him as he is dreaming but are in need of better lives. Now loved ones are seperated & polarized only due to this Chamisa’s violent utterances. The task of an opposition party is not to pressure government into failure but into providing satisfaction to the people like what the wise Malema is doing in South Africa. He’s concerned about the lives of people not about his power unlike Chamisa.